Amphibians derive their name from the Greek word ‘amphibious’ which mean ‘double life.’ This is due to the fact that juveniles live in water and breath using gills, whereas adults develop lungs and live both in and out of water. The tadpole undergoes what is called ‘metamorphosis’ to change into an adult frog. Frogs come in many different colours. Some use this as a warning mechanism to show that they are poisonous, whereas some use this as camouflage to hide from their predators. Some species are even able to change colour depending on their surroundings. 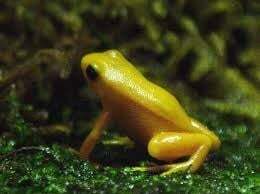 Very little is known about the breeding habits of some species of frog. Here at Deep Sea World, we study our amphibian’s life cycles to try and find out the trigger mechanisms for breeding. When successful, eggs, tadpoles and froglets are exchanged with other zoos and aquariums for further study. This process ensures a good mix of genes and helps to conserve the species. Our collection of amphibians includes the green poison frog, red-eye tree frog, blue poison dart from, golden poison frog and mudskippers. It’s the skin of the Dart Frogs that contains the poison – enough to kill up to 20 adult humans!